VA 700: Appeared in August 1928 as an upgrade to CR 4, running from US 29/VA 28 near North Garden west to Batesville. In July 1933, VA 700 was renumbered as VA 230. Today it is SR 692. VA 701: Appeared in August 1928 as an upgrade to CR 5. Ran from VA 39 (now VA 22) Cismont northeast 1.72 miles. 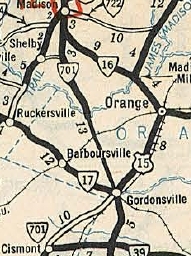 In Dec 1930 (CTB), VA 701 was extended to US 15/VA 17-32 Gordonsville. In July 1932, VA 701 replaced VA 703 from VA 16 (now SR 686-687 jct) Pratt south to Orange County. It appears the original VA 701 was extended a short distance to a rerouted US 15. In July 1933, both pieces of VA 701 were renumbered to VA 231. Today it still is VA 231 plus SR 686 in Pratt. VA 701 replaces VA 703. VA 702: Appeared in August 1928 as a renumbering of VA 374 from US 15/VA 32 Orange to Locust Grove, and upgraded routing of CR 15 to VA 37 (now VA 3) just inside Spotsylvania County near Wilderness. In July 1932 (CTB), VA 702 was extended west as an upgrade to CR 7 to end at CR 1 (now VA 231) Somerset. In July 1933, VA 702 was renumbered to VA 20. East of Orange VA 702 used VA 20 Business, Waugh Blvd, SR 2013, SR 671 through Unionville; SR 743, SR 741 through Rhodesville; SR 742, SR 740 and SR 720 at its eastern end (VA 20 no longer goes into Spotsylvania County). VA 703: Appeared in August 1928 as new primary routing (upgrade to CR 1) running from VA 16 (now SR 687) Pratt south to the Orange County Line. In July 1932, VA 703 was renumbered as VA 701. Today it is VA 231 and SR 686. VA 704: Appeared in August 1928 as an upgrade to CR 5, running from VA 17 (now US 33) Lydia southwest 9 miles. In Dec 1930 (CTB), a second piece of VA 704 was created, from VA 39 (current VA 240) Crozet north 2.93 miles. Also, a 3rd piece of VA 704 was created as an upgrade to CR 2, running from US 29/VA 28 through Wolftown and ending at the Greene-Madison Line. In July 1932 (CTB), VA 704 piece 1 was extended to Boonesville and piece 2 was extended south to Nortonsville. In July 1933, both pieces of VA 704 became part of VA 230. Today, the Crozet to Lydia portion is SR 810. The Madison County piece is still VA 230. VA 705: Appeared in August 1928 as an upgrade to CR 12, running 0.7 miles from VA 16 (now VA 231) Banco to Criglersville. This had once been the routing of VA 16 in the early 20s. 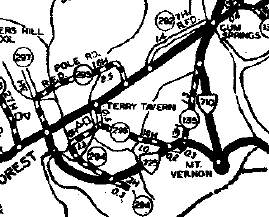 In Aug 1929 (CTB), VA 705 was extended 1 mile. In July 1932 (CTB), VA 705 was extended to Syria. In July 1933, VA 705 became part of VA 231. Today it is SR 670. VA 706: Appeared in August 1928 as an upgrade to CR 4. It ran from VA 16 (curr VA 231) Revercombs Corner east 1 mile. In Aug 1929 (CTB), VA 706 was extended east 2.5 miles. In Dec 1930 (CTB), VA 706 was extended to the Culpeper County line. In July 1932 (CTB), VA 706 was extended to VA 37 (now SR 695) near Boston. In July 1933, VA 706 became VA 232. Today it is SR 707. VA 707: Appeared in August 1928 as an upgrade to CR 2, running from US 211/VA 21 Ben Venue south 9.2 miles to the Culpeper Line. In July 1932 (CTB), VA 707 was extended south 6 miles to Cardova. In July 1933, VA 707 became part of VA 49. Today this is SR 729. VA 708: Appeared in August 1928 as upgraded routing, running from VA 38 (now US 17) Morrisville 6.59 miles towards Bristersburg. In July 1929 (CTB), VA 708 was extended 2.5 more miles. In Dec 1930 (CTB), VA 708 was extended 5 more miles. In July 1932 (CTB), VA 708 was extended via Catlett to the Prince William County line (at the SR 843 crossing). In July 1933, VA 708 was renumbered as VA 233. Today it is SR 806 from Morrisville to Catlett and VA 28/SR 843 over to the Prince William Line. VA 709: Appeared in August 1928 as upgrades to CR 2 and CR 9. Ran from VA 28 Manassas south 12.85 miles. In Aug 1929 (CTB), VA 709 was extended to US 1/VA 31 Dumfries. In Dec 1930 (CTB), VA 709 was extended north from Manassas 6.42 miles. 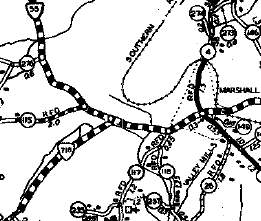 In July 1932 (CTB), VA 709 was extended north another 6.4 miles to Catharpin, then north to 1 mile short of connecting to US 15-50/VA 32-36 Gilberts Corner. In July 1933, VA 709 became part of VA 234. Today this is Duke St in Dumfries which is cutoff by I-95. VA 709 used the piece of SR 638 not parallel to I-95, then VA 234, then SRs 727 and 698 over Occoquan Creek, VA 234, VA 234 Bus, then VA 234 and SR 705 which is still partially unpaved in Loudon County. VA 710: Appeared in August 1928 as a renumbering of VA 314, running from US 1/VA 31 Gum Springs south to Mt. Vernon. In July 1933, VA 710 became part of VA 235. VA 711: Appeared in August 1928 as upgraded routing running from VA 712 (Lee Blvd) Ft. Myer west 2.3 miles. In Dec 1930, VA 711 was extended west to the Fairfax County line. 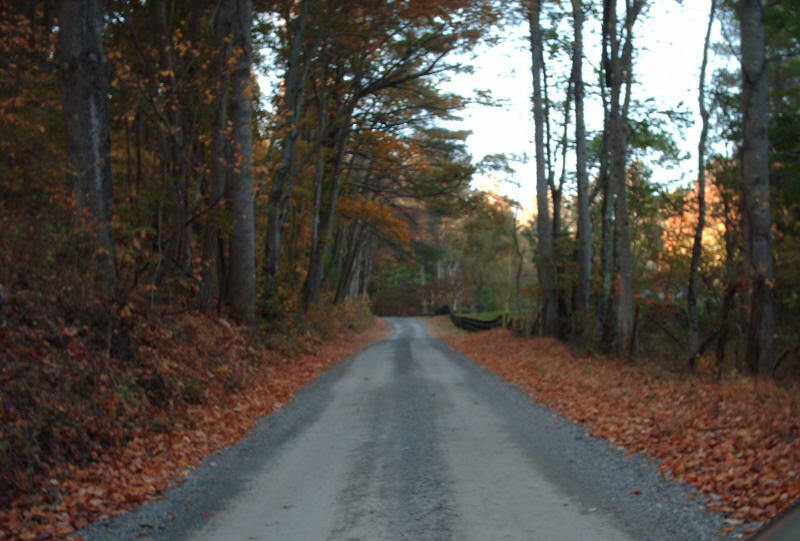 Sometime in 1932, VA 711 was extended to US 211/VA 21 (now US 29/VA 237) west of Falls Church. I can only find a Jan 1933 CTB reference to ROW issues on this stretch in Fairfax County. In July 1933, VA 711 became VA 236. Today it is VA 338 and US 50. 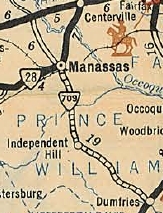 VA 711 only explicitly appeared on the 1928-29 Official maps. It probably used Wilson Blvd in the beginning and moved to what is now US 50. VA 712: Appeared in August 1928 as an upgrade, running from US 211/VA 21 (now US 29) near Falls Church east to VA 711 (now US 50) Ft. Myer. 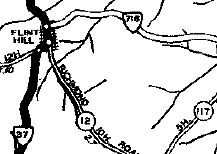 In Dec 1930 (CTB), VA 712 was extended east to US 211/VA 21 (now US 29) at the Key Bridge ("Porters Woods"). In July 1933, VA 712 became VA 237. East of VA 120 VA 712 stayed on Washington Blvd. VA 712 is shown explicitly only on the 1932 Official. VA 713: Appeared in August 1928 as an upgrade to CR 10, running from VA 54 (now VA 7) Clarks Gap west via Hillsboro to the West Virginia line. In July 1933, VA 713 became part of VA 238. Today it is VA 9 except in the VA 287 area it veered north to Wheatland and used 287 back to 9. VA 714: Appeared in June 1930 as an upgrade to CR 1 and CR 7 from VA 39 (5th and Main) Charlottesville south 1 mile. In July 1933, VA 714 became part of VA 239. Today it is Monticello Rd along the VA 20 corridor. VA 715: Appeared in June 1930 as upgraded routing, connecting VA 28 (now Jefferson Park Ave) to VA 39 (now US 250 Business) through the UVa campus on Emmet St. in Charlottesville. About 1932 or early 1933, VA 715 was renumbered as part of US 29 and is today part of US 29 Business. VA 715 does not appear on any map I can find. VA 716: Appeared in December 1930 as upgraded routing, running from VA 39 (now VA 240) near Crozet east to VA 39 (now VA 240) at Mechum River. In July 1933, VA 716 became VA 240. Today it is US 250 except on the west end it used SR 751 and the east end it used SR 752. VA 717: Appeared in December 1930 as upgraded routing from US 1-VA 31 to US 50-VA 36 west of Alexandria. In July 1933, VA 717 became VA 241. VA 718 #1: Appeared in December 1930 as upgraded routing, running from US 1-50/VA 31 Crystal City west to VA 25 (now South Glebe Rd). In 1932, VA 718 was renumbered as part of a rerouted VA 25 and is now part of VA 120. For some reason, the 1931 Official shows it running only part way over to VA 25. 1. VA 37 (now US 522) Flint Hill east to just short of the Rappahannock River (upgrade to CR 3). 2. VA 55 (now F137) near Marshall southwest to the Ada area (upgrade to CR 8). In July 1933, both pieces of VA 718 became VA 242. Today they are both part of SR 647 except at the east end of piece 2 where I-66 destroyed the actual connection to then-VA 55. This VA 718 didn't appear on official maps but is in the 1932 county atlas and also on the 1933 Conoco. VA 719: Appeared in December 1930 as upgraded routing, running from US 29-VA 28 Burtonville west to VA 17 (now F991) near Stanardsville. In July 1932 (CTB), VA 719 was extended with VA 17 to Stanardsville, then south as new routing to Amicus. In July 1933, VA 719 became VA 243. Today it is SR 604, F991, US 33 Business, SR 624 and SR 622. VA 720: Appeared in December 1930, running from US 1-50/VA 31 (old Jeff Davis Hwy) Crystal City west 0.10 miles. In July 1932 (CTB), VA 720 was extended west to the Fairfax County line. In July 1933, VA 720 became VA 244. The eastern half mile of this is now either in the Pentagon parking lot or covered by I-395. VA 721: Appeared in December 1930 as an upgrade to CR 9, running from VA 713 Wheatland (this is not a road anymore, at Catoctin Creek) north to the Maryland State Line at Brunswick, MD. In July 1932 (CTB), VA 721 was extended south as an upgrade to CR 5 to Purcellville, then west with VA 54 (now VA 7 Bus) a short ditance, then replaced VA 724 south for 1.88 miles towards Middleburg. In July 1933, VA 721 became part of VA 234. Today it is SR 690, SR 755, VA 7 Bus, SR 722 which is cutoff by VA 7 bypass, then VA 287 (except Lovettsville used SR 798 and SR 673). VA 722: Appeared in December 1930 as an upgrade to CR 3, running from US 29/VA 16-28 (now US 29 Bus/VA 231) Madison east 1 mile. In July 1932 (CTB), VA 722 was extended east 6.3 miles to Oak Park. In July 1933, VA 722 became part of VA 230. Today it is SR 634. VA 723: Appeared in December 1930 as new primary routing, running from VA 37 (now US 522) Woodville west 3.36 miles to Hawlin. This was an upgrade to CR 7 and may have briefly been part of VA 16 earlier. In July 1932, VA 723 was extended west to VA 16 (now VA 231) Shacklefords Corner. In July 1933, VA 723 became VA 246. Today it is SR 618. The western half of this is still unpaved. VA 724: Appeared in July 1931 (CTB) as an upgrade to CR 5, running from VA 54 (now VA 7 Bus) south 1.88 miles. In 1932, VA 724 was renumbered as part of VA 721. Today it is part of SR 690 plus SR 755. The only map I have that shows this explicitly is a 1932 Tydol map. VA 725: Appeared in June 1931 as new routing, running from US 1/VA 31 Terry's Tavern east to VA 710 (now VA 235) Mt. Vernon. In Oct 1931 (CTB), VA 725 was moved to go via Washington's Mill. The old route became CR 296 (now SR 624 Lueckens Ln and Old Mill Rd). In July 1933, VA 725 became part of VA 235 which it remains today. It is a mystery why this wasn't an extension of VA 710. VA 726: Appeared in June 1931 as new routing, running from VA 54 (now VA 7) to Bluemont. In July 1933, VA 726 became VA 245. Today it is SR 760. Not shown on officials but inexplicably is shown as US 340 on the 1932 Loudon County map. VA 727: Appeared in June 1931 as new routing, running from the new alignment of VA 19 (now VA 6) to the old alignment (now SR 624) west of Columbia. In July 1933, VA 727 became VA 247. Today it is SR 656. I understand building a road between the old and new alignments, but I am at a loss why it rated a primary route. VA 728: Appeared in July 1932 as new routing, running from US 211/VA 21-37 Washington northwest 1 mile. In July 1933, VA 728 became VA 248. Today it is SR 622. VA 728 is shown but not labeled on the 1932 Rappahannock County map. 728 is the highest 7xx route number in the 1928-33 system. Creation: Unsure of exact date of creation, but VA 785 is listed in the 2001 VDOT Route Log. It runs as a multiplex with US 29 and part of US 58. This is likely only 2-3 years old. This has been the only VA 785. Posting: No VA 785 signs exist, but there are proposed I-785 signs up. Comment: From its creation until May 2002, this was the highest state route number in current use. Does not appear on any maps that I am aware of. It is, of course, the precursor to the eventual I-785.